Marshes are wetlands that flood with water and are dominated by plants adapted to wet soils. 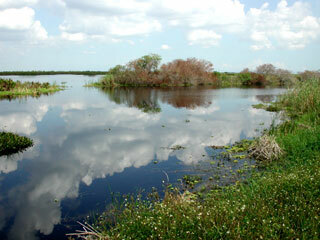 Large stretches of freshwater marsh exist throughout the Everglades, providing valuable wildlife habitat. Marshes are defined as wetlands that are flooded with water and dominated by grasses and sedges as well as other plants that are adapted to saturated soils. These communities provide habitat that allows for the survival of wildlife during even times of flooding and drought. sawgrass marsh: a large expanse of sawgrass containing standing water for much of the year. wet prairie: dominated by emergent plants including grasses and other low growing plants in large areas of open water. 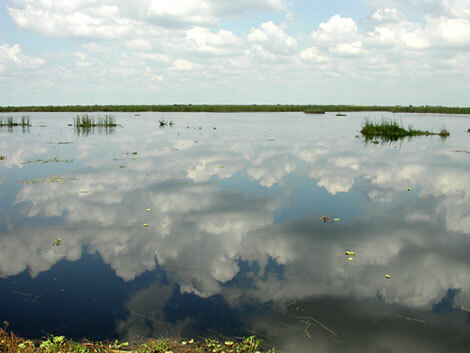 sloughs: main routes of moving water through the Everglades. alligator holes: located in marshes with long hydroperiods throughout the Everglades, alligator holes result either from fire burning an area of rich peat soil or from alligator activity.